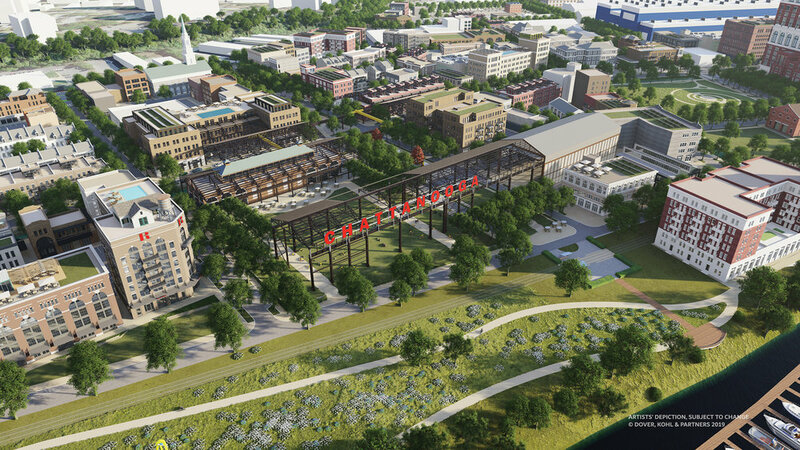 During a presentation yesterday evening, the public received a first look at the proposed redevelopment of 112 acres of Chattanooga riverfront. The program was held on Riverfront Parkway inside the blue high bay buildings (formerly known as Alstom), which are within property owned by Urban Story Ventures. The vision depicts Chattanooga’s next great neighborhood, where people can live, work, and enjoy themselves along the Tennessee River. 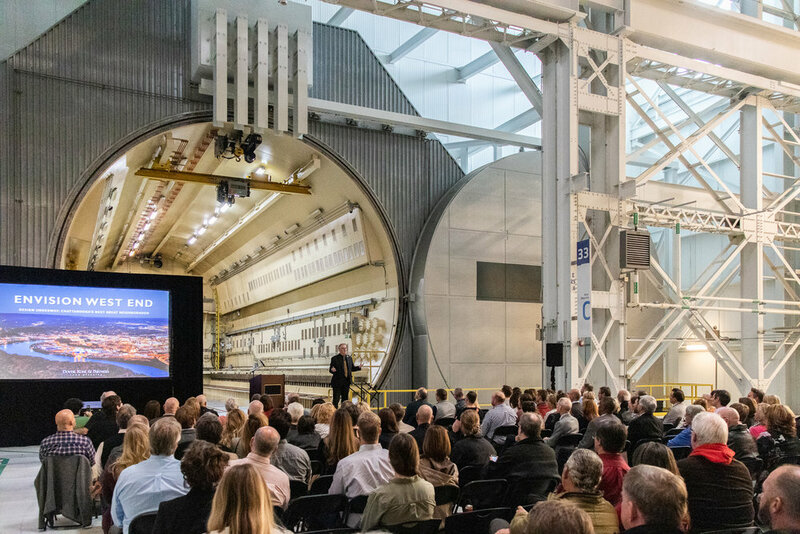 Dover, Kohl & Partners was selected to draft the initial concepts together with a multidisciplinary team of experts that included Horsley Witten Group, VHB Engineering, Hall Planning & Engineering, and Partners for Economic Solutions. 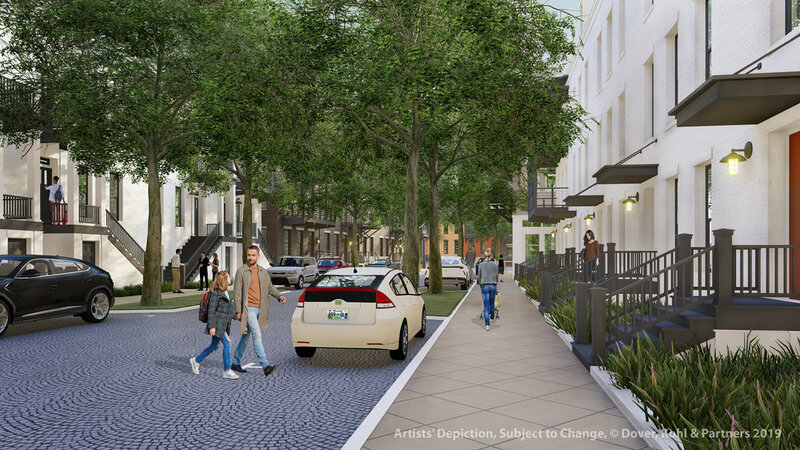 The concepts outline a highly walkable, bike-friendly “car-optional neighborhood,” which does not mean eliminating cars but instead expanding the choices for getting around. Tree lined streets and green public spaces will restore balance and help heal the land, which was once home to heavy industry. A fanned street grid will connect people to Riverfront Parkway and guide them toward the Tennessee River. 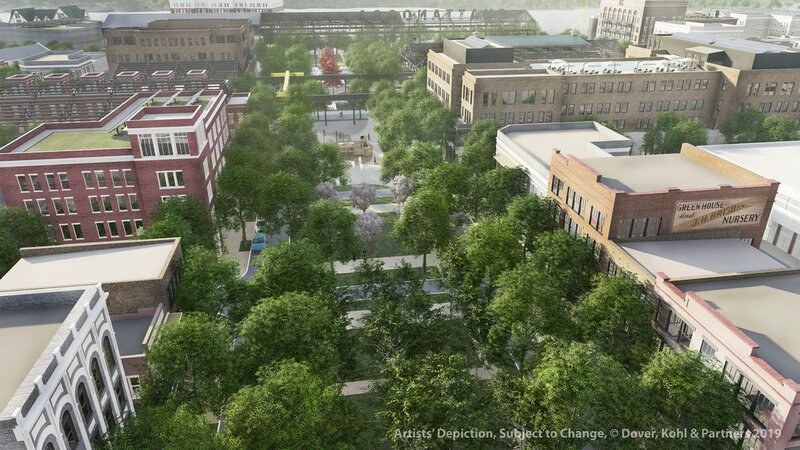 The plan calls for mixed-use redevelopment of the 112 acres with varying house types and workplaces as well as recreation and entertainment. The convenience will make daily life more practical, but we also want the neighborhood to be packed with charm, to make it a fun place to be. The concept calls for salvaging materials from the old factories, incorporating cool elements of Chattanooga’s combustion history in the architecture, and continuing the waterfront revival with the strong emotional connection to the river and nature. To create that sense of place, the draft design recommends maximizing variety in the architecture, but also setting up basic common elements that will let the individual buildings work together in an ensemble. The most important of these elements is that all the buildings will be street-oriented. This way the architecture and street network can help re-stitch this section of Chattanooga together and tie it to downtown. For visitors and residents, visual cues and landmarks throughout the district will establish that they are in a unique and defined neighborhood. To preserve Chattanooga’s history, the design proposes keeping some of the steel frames of the old factories, stripped to their metal structures, letting them span between new buildings and over the streets and parks under them. Since the Tennessee River is an essential feature of the new neighborhood, the plan advises keeping the vast majority of land along the riverbank as a linear park. The designs also expand on the Tennessee Riverwalk with a series of public spaces. Building on the river connection, the plan seeks to bring the river experience into the land through canal features, spaces for recreation and innovative stormwater devices that double as landscaping and water features. All of the new greenspaces and trees will help treat stormwater before it flows into the river.